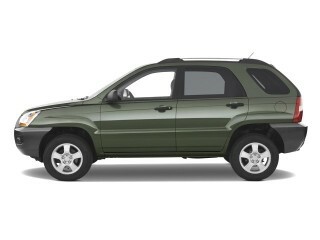 Take a look at the Kia Sportage if the 2008 Hyundai Tucson’s styling doesn’t quite suit you. The 2008 Hyundai Tucson no longer stands out in its class for performance or safety, but it’s still a great value. 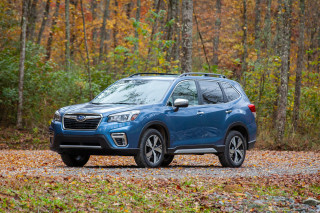 In order to bring you the most comprehensive review possible, the car experts at TheCarConnection.com have gathered views from some of the best reviews by reputable sources. TheCarConnection.com's editors also have drawn from their driving notes on the Tucson to make the review especially insightful. The compact Tucson, a carlike crossover SUV, was introduced as a smaller-scale alternative to the Santa Fe in 2005, and hasn't changed significantly since. A 140-horsepower 2.0-liter four-cylinder powerplant is standard in the 2008 Hyundai Tucson GLS and can drive either the front or all four wheels via a five-speed manual or optional four-speed automatic transmission with manual-shift capability. The SE and Limited models levels include a 173-horsepower 2.7-liter V-6 that's available only with the automatic gearbox. The optional all-wheel-drive system normally routes up to 99 percent of the power to the front wheels, or up to 50 percent to the back as needed, or it can "lock" the center differential for a 50/50 split, good for deep snow or mud. There's not a big difference in power between the two engines--especially if you get the four-cylinder with the manual transmission--though the four can be noisy when accelerating hard, and it doesn't shift quite as smoothly with the automatic transmission. For those who plan to haul a full load of people and cargo, the more expensive 2008 Hyundai Tucson V-6 model is the better, more refined choice, though it comes with a disagreeably aggressive throttle that's hard to finesse when parking. The 2008 Hyundai Tucson rides smoothly, though it can get pitchy on rough surfaces, and a full load makes the ride somewhat harder. Handling isn't a strong point here; the Tucson lets you know right away that it's not at all sporty, exhibiting plenty of body lean and mushiness if you happen to push it hard. Inside, the 2008 Hyundai Tucson has impressive materials, and the instrument panel follows a rounded, organic style, with a prominent center stack and audio controls mounted high up. Most will find the driving position about right, although the footwells are narrow and taller drivers will notice their knees resting against the center console. The backseat is fine for two adults but only good for three small kids--because of shoulder room, not legroom. The Tucson is now one of the oldest designs in Hyundai's lineup, but it doesn't quite meet the interior/assembly quality of its other models. The five-passenger 2008 Hyundai Tucson comes in three trim levels: GLS, SE, and Limited. 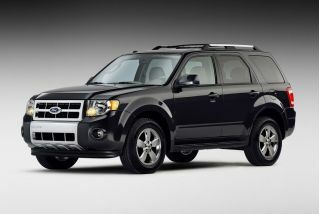 Base GS models come standard with power accessories and an 80-watt AM/FM/CD audio system. Above the sporty SE, the top-of-the-line Limited adds leather upholstery, heated front seats, and automatic climate control, among many other items. The only options are all-wheel drive, a power tilt-and-slide sunroof, a Bluetooth hands-free calling interface, and a 200-watt CD changer with subwoofer. And all audio systems now have XM Satellite Radio compatibility and an auxiliary jack. Active head restraints have been added to the Tucson's long safety-equipment list, which already includes front-seat side airbags, side curtain bags, electronic stability control, and anti-lock brakes. The 2008 Hyundai Tucson is a shining star in the federal government's crash tests, with top five-star results in all frontal and side tests, but it's judged only Acceptable in the insurance-industry-funded IIHS tests. You may wish to buy it for its interior, but the 2008 Hyundai Tucson probably won't turn any heads. Boring on the outside, nicer on the inside, the 2008 Hyundai Tucson is a timid-looking crossover that may appeal to some people's sense of tradition. The compact Tucson, a carlike crossover SUV, was introduced in 2005 as a smaller-scale alternative to the Santa Fe and hasn't changed significantly since. Kelley Blue Book says the 2008 Hyundai Tucson is "more conventional in appearance, styled largely like other small-scale SUVs." Cars.com says the Tucson Hyundai "has a masculine, athletic appearance" and that "SE and Limited models feature bodyside cladding." Although the Tucson Hyundai's overall design is not exactly cutting-edge, Mother Proof considers it "cute...not at all victim to the boxy and plastic-feeling exteriors of its competitors." Inside, the 2008 Hyundai Tucson has impressive materials, and the instrument panel follows a rounded, organic style, with a prominent center stack and audio controls mounted high up. Mother Proof also reports that the Hyundai Tucson is "comfortable and ergonomically sound on the interior, it feels cozy inside." ConsumerGuide confirms this assessment, at least as far as the driver's seat is concerned: "The gauges are unobstructed and clearly marked." Edmunds says simply that the Hyundai Tucson has a "stylish and functional interior." 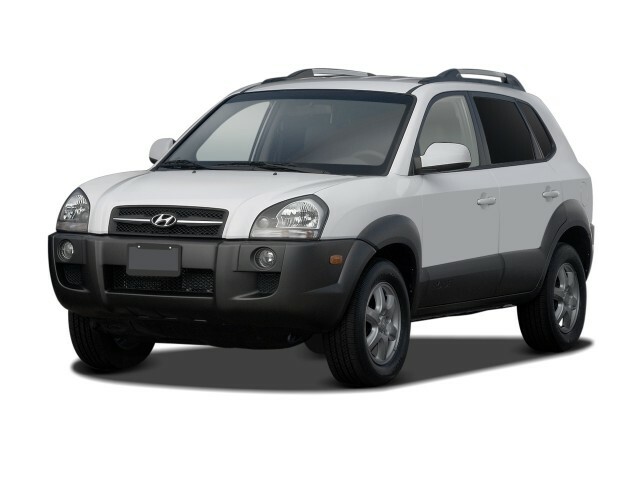 The 2008 Hyundai Tucson offers adequate, if not superior, handling on the pavement, but fuel economy lags for its class, right along with acceleration. The 2008 Hyundai Tucson sets a low hurdle for performance, though it has reasonable power in V-6 models and a mostly smooth ride. The 173-hp 2.7-liter V-6 installed in upper-level trims is optional in the base GLS model. There's not a big difference in power between the two engines--especially if you get the four-cylinder with the manual transmission--though the four can be noisy when accelerating hard, and it doesn't shift quite as smoothly with the automatic transmission. For those who plan to haul a full load of people and cargo, the more expensive 2008 Hyundai Tucson V-6 model is the better, more refined choice, though it comes with a disagreeably aggressive throttle that's hard to finesse when parking. “The V6 is stronger, but it is still weaker than some rivals' 4-cylinder engines, with little power reserve for passing," ConsumerGuide says. According to Edmunds, the "V6 engine that generates 173 horses and 178 lb-ft of torque" will "accelerate to 60 mph in about 10.7 seconds, about a second or so off the quicker four-cylinders in the segment." They also advise that "power from the standard four-cylinder is barely adequate, so we recommend you opt for the V6"; however, Mother Proof reports that "the V6 engine has power, but isn't exactly peppy." According to Cars.com, "either a Shiftronic four-speed automatic transmission or a five-speed manual gearbox can be installed" in this year's Tucson; Hyundai offers both versions with “front-wheel drive or optional four-wheel drive." Edmunds reports that "the four-speed automatic isn't quite as smooth as the five-speed units offered by competitors, but it's alert enough to usually keep the V6 right in its power band." 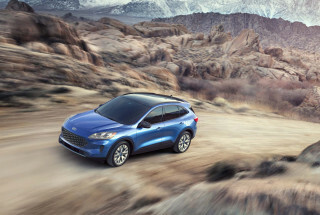 The optional all-wheel-drive system normally routes up to 99 percent of the power to the front wheels or up to 50 percent to the back as needed, or it can "lock" the center differential for a 50/50 split, good for deep snow or mud. The Hyundai Tucson's fuel economy is a bit of a disappointment. 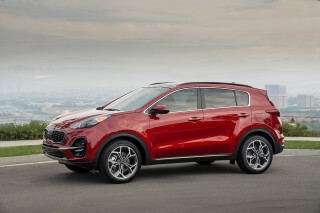 In ConsumerGuide's testing, "AWD V6 Tucson and Sportage models averaged 20.8 mpg," while Edmunds reports EPA estimates as "17 mpg city and 23 mpg highway, a bit below the class average." Figures for the four-cylinder model are "only a couple city mpg better." The 2008 Hyundai Tucson rides quite smoothly, though it can get pitchy on rough surfaces, and a full load makes the ride somewhat harder. Handling isn't a strong point here; the Tucson lets you know right away that it's not at all sporty, exhibiting plenty of body lean and mushiness if you happen to push it hard. 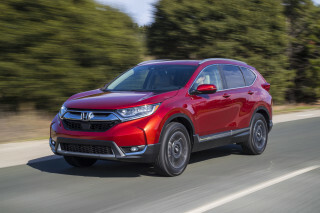 Cars.com considers the ride to be "pleasantly smooth on most surfaces," but adds "undulating pavement and even moderate bumps can transmit some roughness to occupants." However, ConsumerGuide says ride quality is a Tucson Hyundai “asset...composed and comfortable around town and absorbent over all but sharp bumps at highway speeds." Edmunds says, "on the road, the 2008 Hyundai Tucson provides a carlike ride and relatively sporty handling that makes it a little more fun to drive than many other compact SUVs," but Kelley Blue Book responds that while it is "comfortable enough on the road with its soft and easy-riding suspension," they suggest that the "Tucson doesn't feel particularly sporty in regular driving." The 2008 Hyundai Tucson has ample room for adults up front and kids in back, but the cargo hold won’t hold too much. 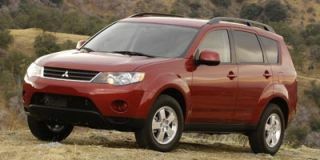 Comfort and quality come in mixed doses aboard the 2008 Hyundai Tucson, according to reviews from respected sources and the editors at TheCarConnection.com. Cars.com reports that "The [Hyundai] Tucson's five-passenger interior includes a 60/40-split flat-folding rear seat...the seats are quite supportive and reasonably comfortable." ConsumerGuide notes that "legroom is adequate... headroom is generous. The seats are comfortable and have good side-bolster support, but the seatback is a little too firm," adding that "testers complained of tight foot space." Edmunds agrees that in the Tucson, Hyundai has fitted a "generous amount of legroom up front," but suggests that "larger passengers may be a bit cramped in back." 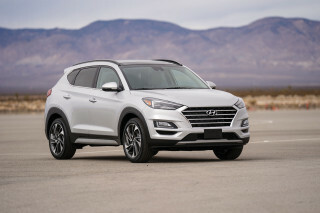 Kelley Blue Book points out that the Tucson is "geared toward single folks more than families," adding that "the 2008 Hyundai Tucson has plenty of head and elbow space up front, as well as supportive and reasonably comfortable seats," but warns that "rear space is a bit smaller than average for this class." In the opinion of Mother Proof, "space in this car is comfortable, great for grocery runs, but maybe not the family camping trip. For a trip to the mall, yes; a trip to the national park, not so much." Cargo and storage space is good aboard the 2008 Hyundai Tucson, but not outstanding. Cars.com reports that "the fully reclining front passenger seat can be folded forward...the plastic cargo floor has multiple tie-down locations." Cargo space totals 22.7 cubic feet with the rear seat up and 65.5 cubic feet with the seat down, which Cars.com points out "falls short of the [rival] Santa Fe's, but the area is easy to access. " ConsumerGuide adds that the Hyundai Tucson's "seatbacks fold without removing the headrests to create a flat load floor." This source reports "a convenient separate-opening liftgate window," but points out "the gate itself doesn't rise high enough to clear a six-footer's head," and concludes "there is poor in-cabin storage space." The reviewer at Mother Proof admits, "I could make it work if I were judicious with my luggage, but throw in a double-stroller and a Pack and Play and it would be uncomfortable." The Tucson is assembled with care, but some materials are less than luxurious. Edmunds says "the Hyundai Tucson features a modern cabin design with a straightforward layout and good build quality," but adds that there are "a few too many hard plastic surfaces and standard cloth trim of questionable taste." ConsumerGuide, however, praises the Hyundai Tucson's ergonomic design, saying the Tucson Hyundai's "gauges are unobstructed and clearly marked...all controls are grouped conveniently in the easy-to-reach center dashboard stack." While Cars.com describes the 2008 Hyundai Tucson as "impressively quiet," ConsumerGuide reports "moderate tire roar on all but ultrasmooth surfaces," adding that the "4-cylinder engine is coarse and buzzy. 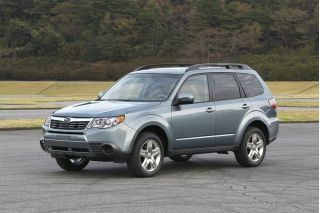 The V6 is quiet at cruise but strains loudly at full throttle." The 2008 Hyundai Tucson offers better-than-average security for its occupants. 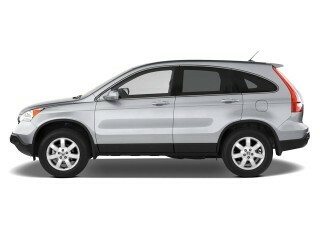 The 2008 Hyundai Tucson does quite well in providing a safe driving experience. It received perfect scores in National Highway Traffic Safety Administration (NHTSA) crash tests and mixed assessments from the Insurance Institute for Highway Safety (IIHS), resulting in an overall score of "acceptable" in frontal offset crash tests. Edmunds reports the Hyundai Tucson "offers a generous level of standard safety equipment for a vehicle in this class, including antilock disc brakes with brake assist, stability and traction control, front seat side-impact airbags, head curtain side airbags and active front head restraints." Cars.com notes that "side-impact and side curtain airbags are standard, giving the Tucson [Hyundai] a total of six airbags...side curtain airbags, seat-mounted side-impact airbags, an electronic stability system and all-disc antilock brakes with traction control are standard." This source also points out "new active front head restraints move forward in a rear impact to protect against whiplash" for the new 2008 Hyundai Tucson. Cars.com also asserts that in the Tucson Hyundai "visibility is...satisfying because of the long glass in the rear doors." Kelley Blue Book also says that from the Hyundai Tucson's driver's seat, "Visibility is generally good, helped by lengthy rear-door glass," but that "wide rear pillars impair the view slightly." If you like power everything, you'll appreciate the 2008 Hyundai Tucson’s upscale features. Reviewers consulted by TheCarConnection.com were mostly impressed with the standard and optional features available on the 2008 Hyundai Tucson. Edmunds reports three basic trim levels for the Hyundai Tucson: "base GLS, midlevel SE and top-of-the-line Limited." The base Hyundai Tucson GLS does not lack for standard features; according to ConsumerGuide, "standard features on the GLS include 16-inch alloy wheels, heated outside mirrors, full power accessories and a CD/MP3 stereo with an auxiliary audio jack and satellite radio." Cars.com adds that the Tucson Hyundai base trim also offers "keyless entry with an alarm, an intermittent rear wiper and a six-speaker CD stereo." When it comes to options on the 2008 Hyundai Tucson, Cars.com reports "a leather-wrapped steering wheel, air conditioning and cruise control" and adds that in a fully loaded Tucson, Hyundai fits "heated leather seats, automatic climate control and a six-CD stereo." Kelley Blue Book remarks that the top trim levels of the Hyundai Tucson offer "XM Satellite Radio with three-month free subscription."